Şakşuka has been on my list of dishes to try out in the kitchen for a long time. I’ve eaten it numerous times both in Istanbul and London, where it’s been served as a meze (or entrée) to some other, usually meaty, dish. Each time, I’ve swooned over its delectable combination of creamy golden aubergines and savoury tomato sauce, and felt it deserved to take pride of place in a meal. Whilst hunting for a recipe for this dish, I discovered that there are, in fact, a million different ways to make şakşuka. Also known as shakshuka, shakshouka or chakchouka, it literally means ‘a mixture’ or ‘shaken’. 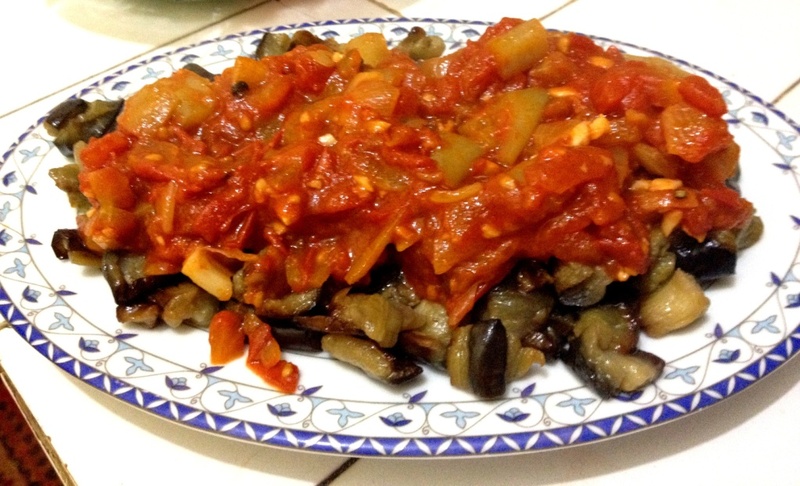 Thought to originally emanate from North Africa, there seems to be version upon version of it across the Middle East, each made with different combinations of fried vegetables and tomato sauce. In some places, eggs are cracked into the fried vegetables, and it’s served with hunks of fresh bread as a breakfast dish (this recipe and this recipe are definitely on my list to try next!!). In Turkey, there are two main ways to make şakşuka, according to Semilicious. One is made with mixed fried vegetables, and the other with only aubergines. Given my love of all things aubergine-related, I plumped for the latter option. Although inspired by the diversity of recipes out there, I opted to keep mine quite simple. For a handy how-to that’s very useful for practising your Turkish comprehension, also check out this video: Şakşuka – nasıl yapılır? Using a vegetable peeler, peel the aubergines at intervals into stripes (giving you a nice zebra-effect). Cut into 1 inch cubes, place in a bowl and salt generously. Leave for 20 minutes then rinse under cold running water and squeeze dry. NB this is supposed to draw out the aubergines’ moisture and bitterness, although cooks debate whether it’s really necessary. I find it makes them more tender and creamy in the end, but if you’re pressed for time you can skip this step. Pour enough olive oil into a heavy-based frying pan to just cover it. Heat over a medium heat, then fry the aubergines until they turn soft and begin to turn golden-brown. Remove from the oil with a slotted spoon and tip onto a plate lined with kitchen roll to absorb excess oil. Leave to cool. Heat the remaining oil in the same pan (you might need to add a splash more), then fry the onions until translucent. Add the cumin, and stir through. Next, stir in the peppers and fry for a minute or two, until soft. Then add the garlic, chilli flakes and tomato puree and stir until all ingredients are well coated. Add the diced tomatoes, one teaspoon of sugar and a dash of water. Turn up the heat and allow to bubble away vigorously for a few minutes. Check the seasoning, and add salt and pepper to suit your taste. Then lower the heat, cover and simmer for around 20 minutes. Check the seasoning again and adjust as you like. The sauce should be quite thick and sticky at this stage, rather than watery – if it seems too thin, turn up the heat again and remove the lid to allow the sauce to reduce. To serve, pile the aubergines onto a plate and spoon the sauce over the top. Garnish with the chopped parsley. 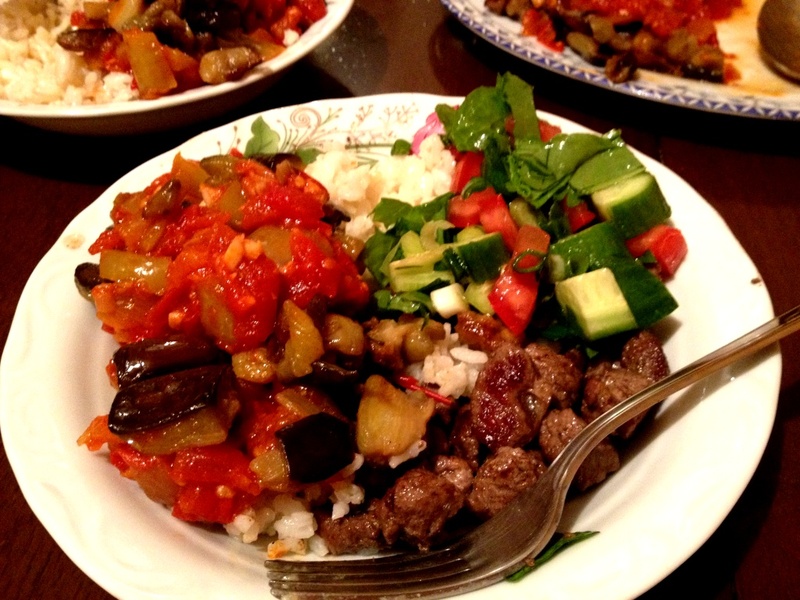 I served this dish with sautéed lamb, pilaf and a mixed salad. It was even better the next day, reheated and eaten with chunks of buttered bread.